Black Burnished Ware 1 can be cooking pots, dishes and bowls made in England post 43AD and would be hand formed in its early form and wheel thrown later. It is based on native wares made in Dorset in surface kilns of the bonfire type and was distributed throughout Britain and was quite commonly used. Made from a paste, it is usually coarse, granular and dense black or dark grey. The surface of the bowls and dishes are completely burnished as opposed to the cooking pots which are part burnished. The cooking pots themselves are decorated with latticing with wavy or looped lines or with arcs. This type of ware has often been termed as fumed ware or cooking pot ware. The body of the object could be made up of any of, and not exclusive to, the following: quartz, flint, black or red iron ore and shale. Without certain additions to the pot before firing it could well explode in the kiln during firing. It was roughly around the time of the invasion by Claudius in 43 AD that the process turned to the wheel thrown method. 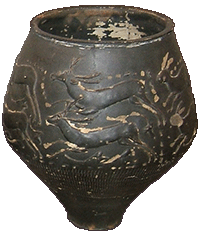 This type of pot can be found in cemeteries as grave goods. Black Burnished Ware 2 can be cooking pots, everted-rim jars, dishes and bowls made in England c. 140AD and would be wheel thrown and made at Rossington Bridge near Doncaster and also near the Thames Estuary in Kent and distributed in south east and northern England. In contrast to BB1 this is a hard and sandy fabric and greyer than its counterpart but is finer. Jars and bowls have a lattice-decorated band across the body and dishes may well have a single horizontal wavy line. The body of the object could be made up of any of, and not exclusive to, the following: quartz, black iron ore and mica which are all mixed with sediment. It seems that with the popularity of BB1 throughout its distribution, especially amongst the army, in the north on Hadrian’s Wall in particular, that BB2 developed at the time it did when the former proved successful at around 120AD.